I love Harris Tweed for its beautiful range of colours and textures. 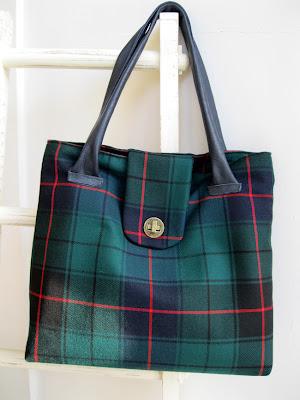 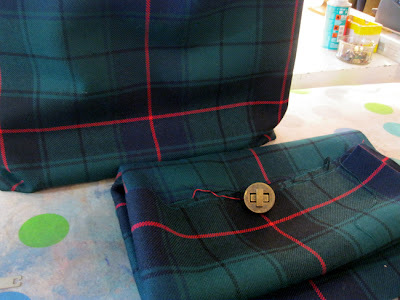 This bag was a commission for a ladies birthday present and the plaid has a link to her family name, making it that bit extra special. 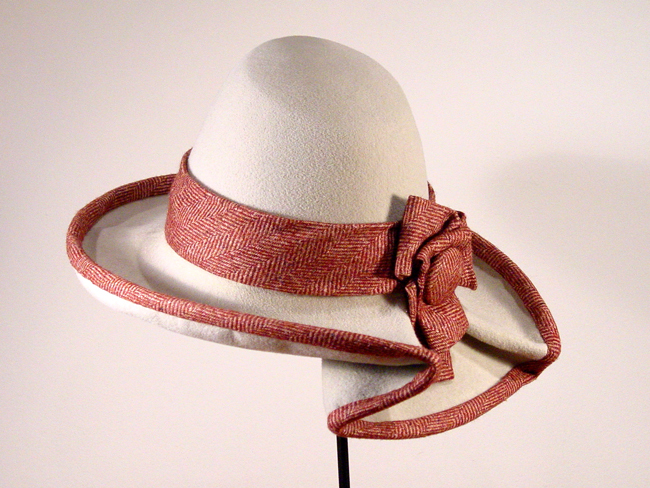 I used a rich red silk lining and navy blue leather straps to compliment the colours in the fabric then added a hard card bottom, comfortable shoulder length straps and a brass fastener. 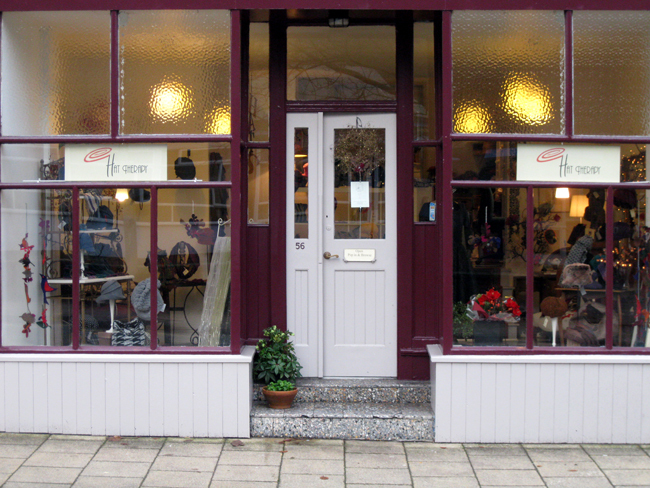 This morning while the sun was out I took a few photo's of the shop as I don't have a 'virtual tour' version at the moment. 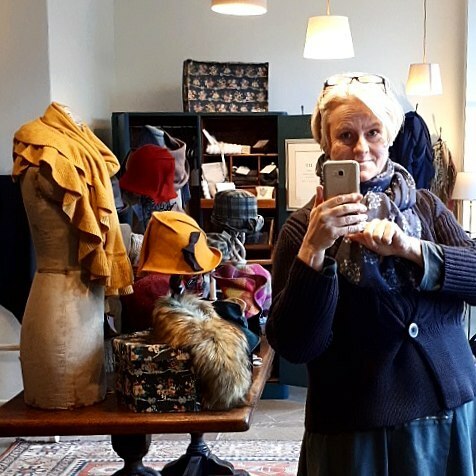 On Dec 1st I will have been open for 7 years so will be hosting a celebration and Christmas Fair with lots of textile gift ideas to choose from so if you are local do pop in for drinks and nibbles. 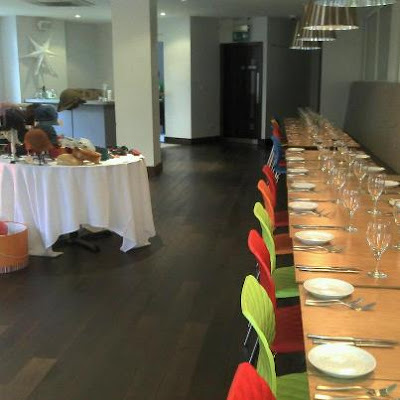 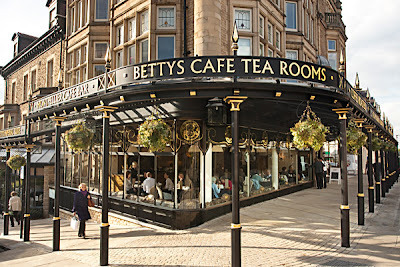 I will also be giving at luncheon talk in Leeds for a group of ladies who work in the city. We are all meeting at a restaurant called Create, I thought that was very apt. 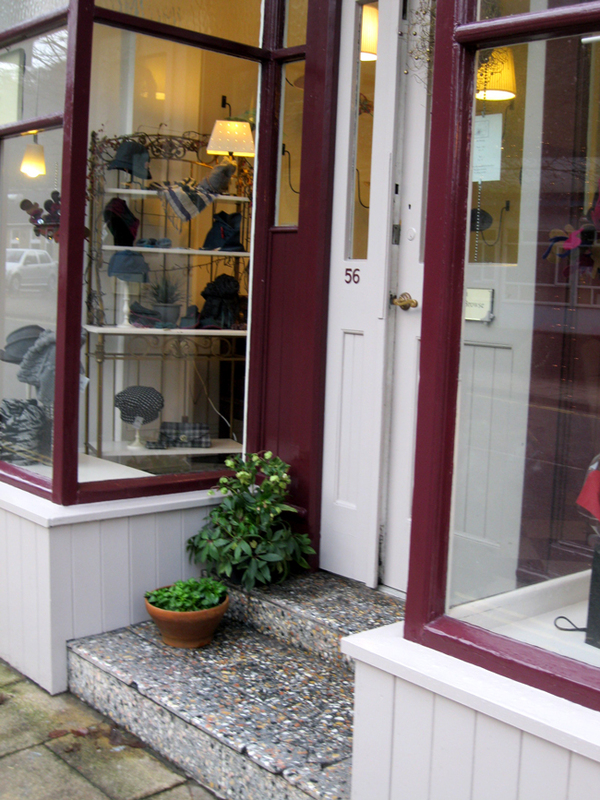 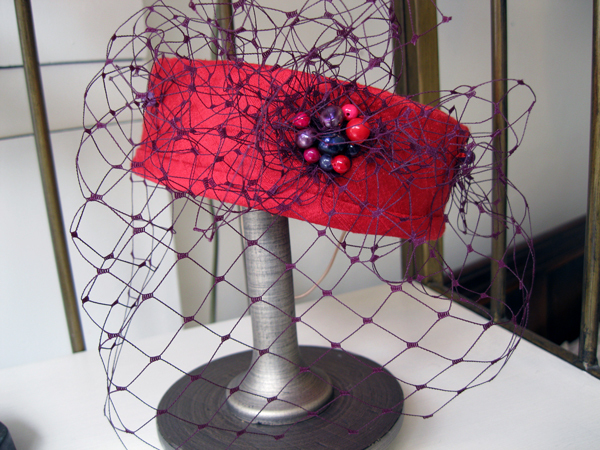 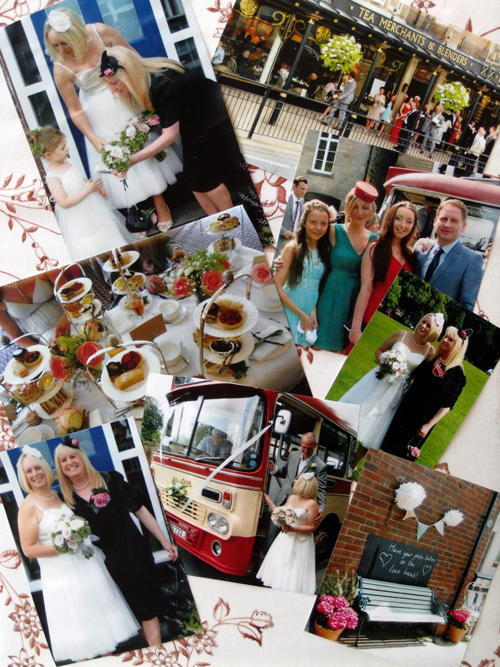 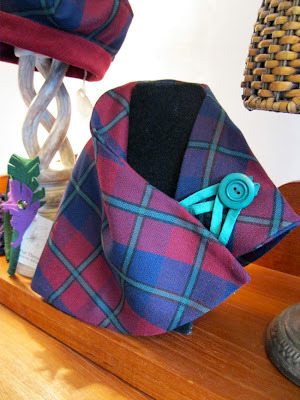 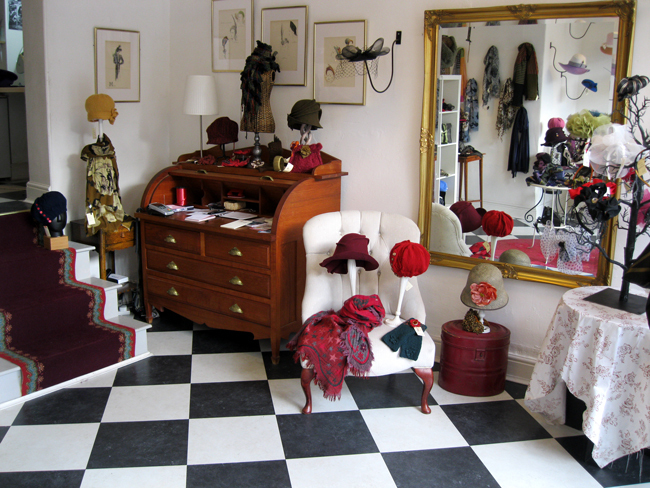 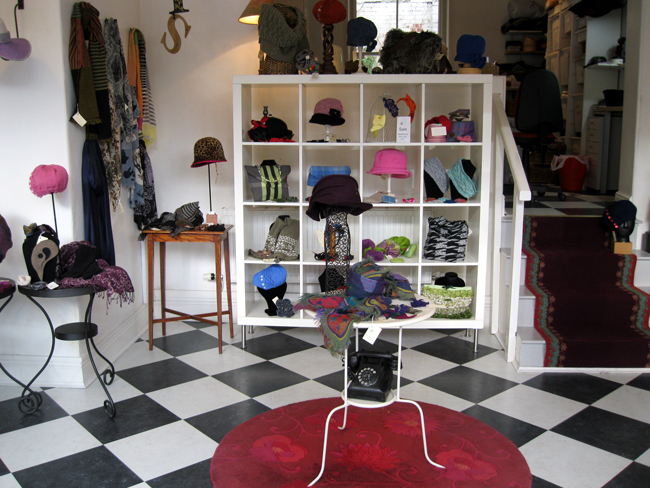 !.I will be taking along millinery materials, and a selection of finished headwear for them to try on etc. 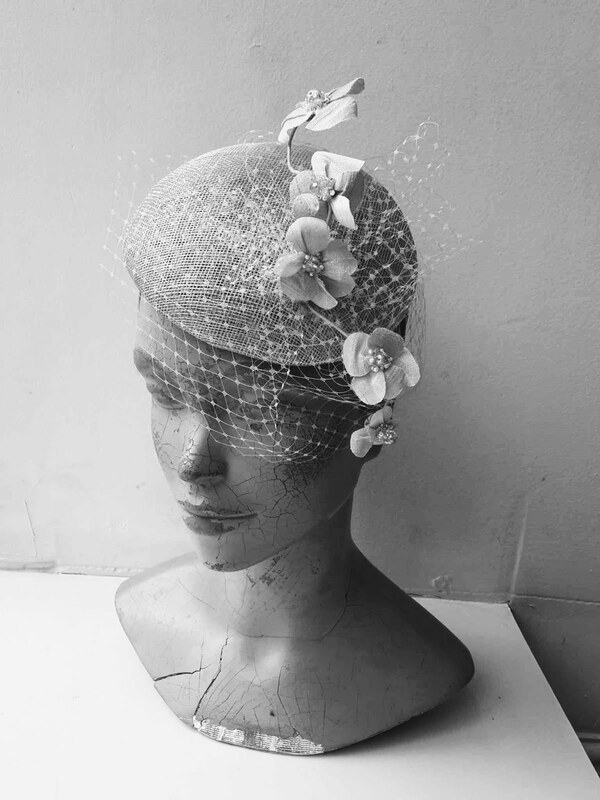 Finally some of my work will be featured in a Finnish wedding magazine. 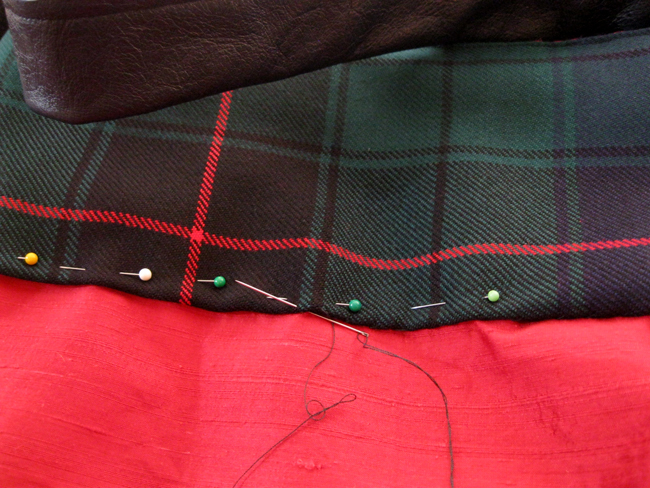 I think that's quite enough for one week.The following week is just as busy so I better get back to some sewing. 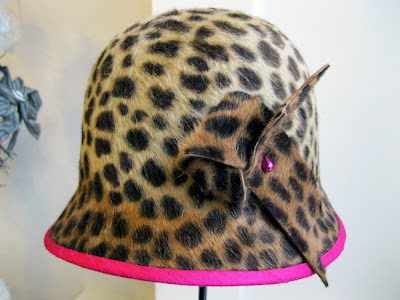 A story of three felt hats, the top one I made from a luxury leopard print felt, then trimmed with bright pink dupion silk, added a hand cut felt twist and a bright pink bead to secure it in place. 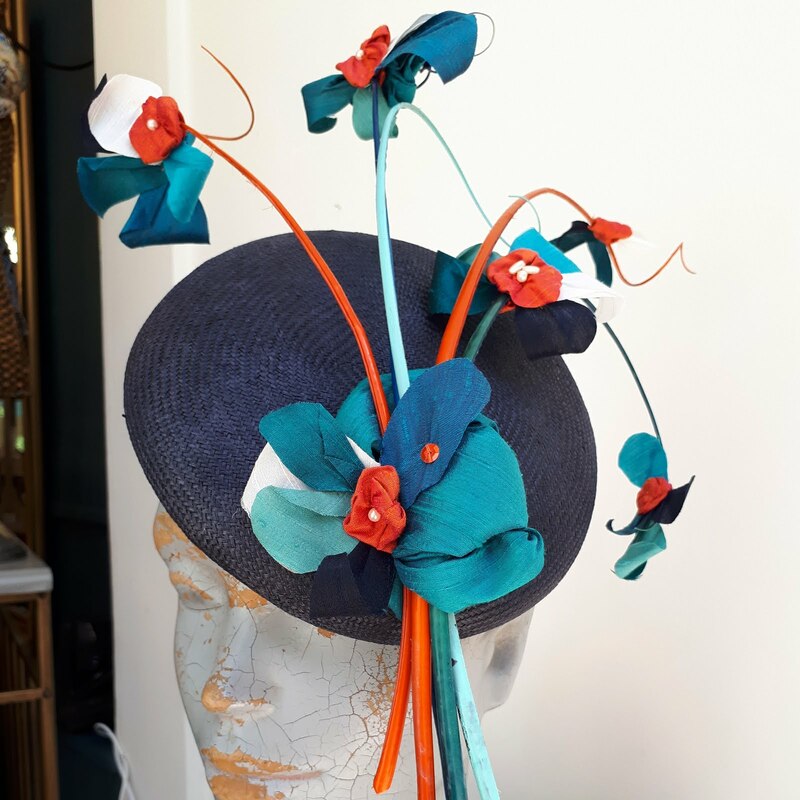 The other two were made by Holly who is also with me on placement and as you can see is really in the swing of hat making. 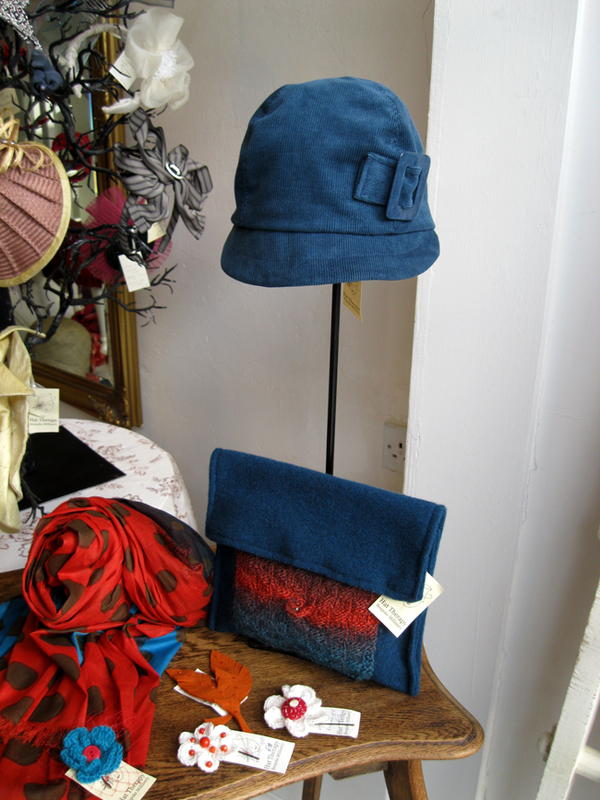 All three are now in the shop and I expect they will be on someones Christmas wish list very soon.! Two different styles of bows. 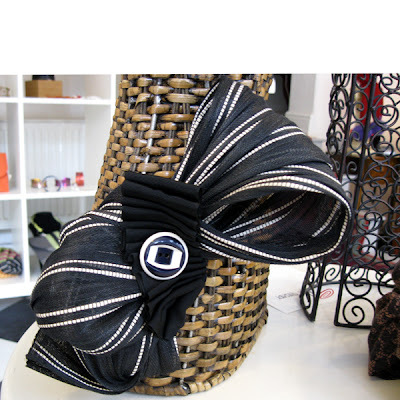 The top one is made from crin a synthetic mesh, the bottom one vintage gross grain ribbon.The crin bow is sat on a black sinamay base edged with black raw silk with a small vintage petersham ribbon bow to secure it into place. 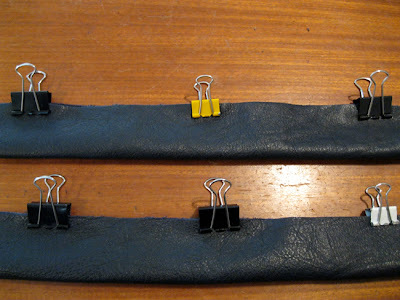 The black gross grain ribbon has been wired so that it can be twisted into position and anchored with two buttons one sitting on top of the other. 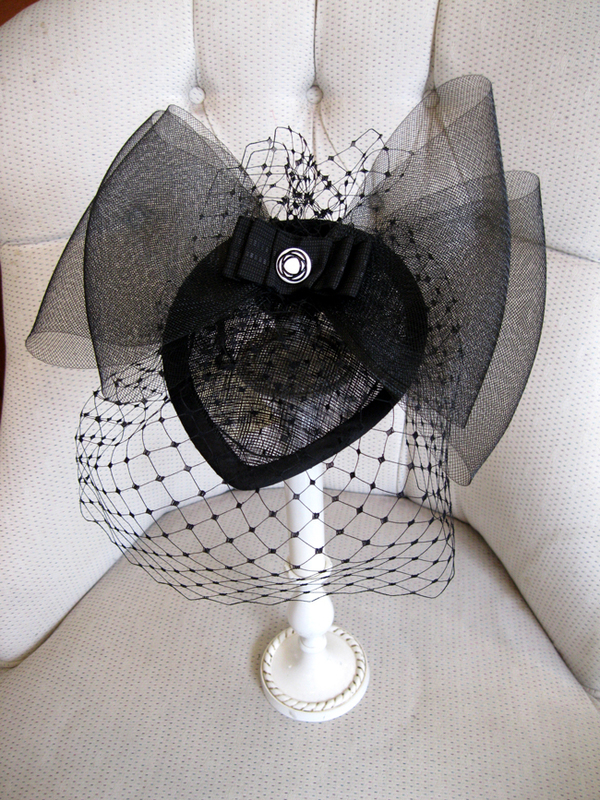 There are lots of black tie weddings at the moment so theses pieces are now in the shop waiting to be whisked away. 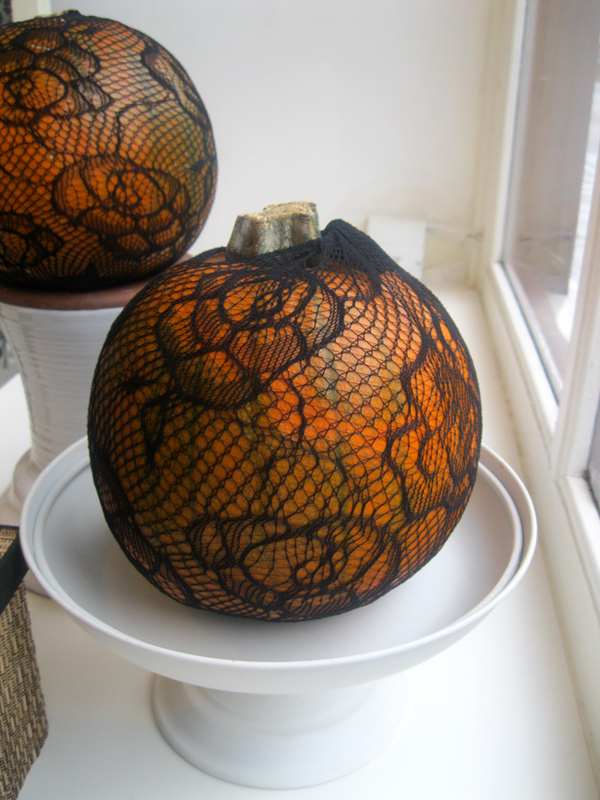 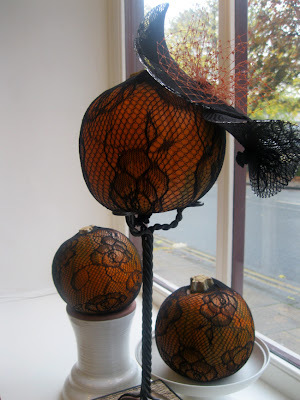 With a pair of Lacy black tights, three pumpkins and a little brim reed [plastic wire] Josie who is on placement with me gave me a hand this morning to whip up a quick Halloween window display. I showed her how to create a headpiece with brim reed and a pair of tights. The brim reed is held together with brass Ferrel and stretches out the lace tights to help create a sculptural shape. 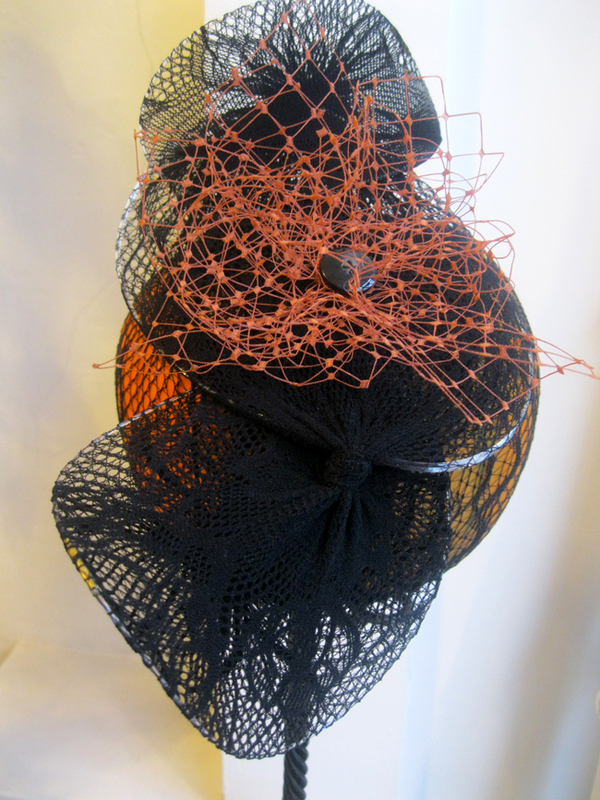 A little knotting, pumpkin coloured birdcage veiling and a clip and it was ready to wear. I wonder if anyone will want to try it on.? Last week I found this lovely piece of teal wool cloth it is plain one side and patterned the other so just perfect for making hats and bags of all styles. 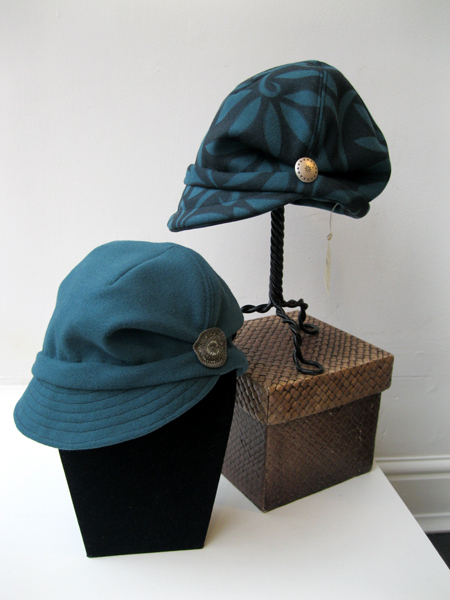 They both have silk linings and a detail on the pleated side of the hat. 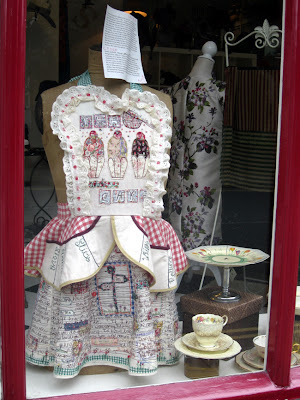 They have just gone into the shop window and had some nice comments so I guess they won't be there for long. 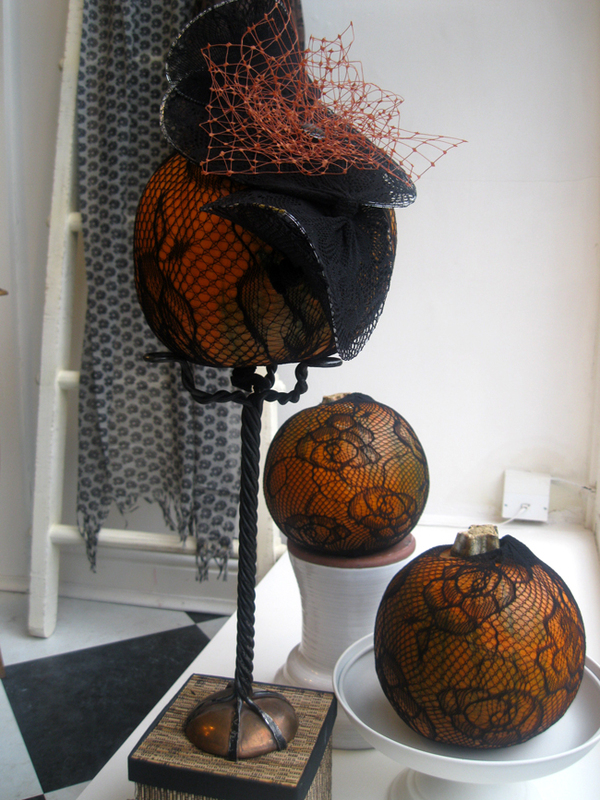 This week these two felt cloches have been made by my interns Fran and Josie. 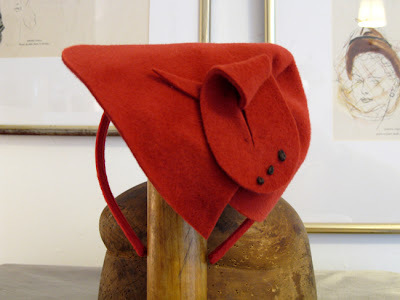 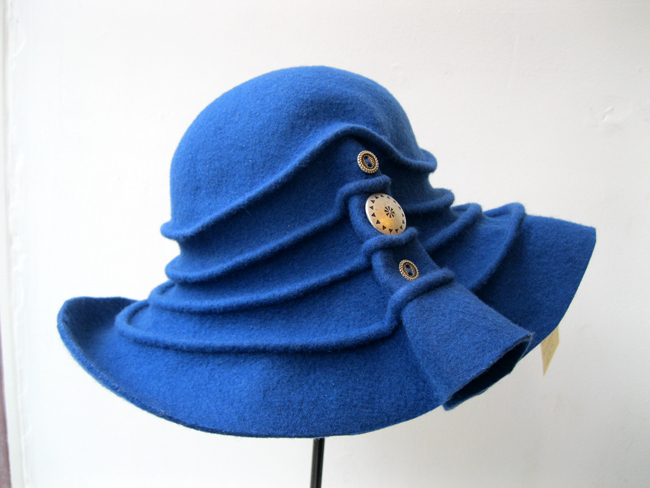 I started them off with steaming and stretching the top of the felt over a domed crown block then once it had taken shape I showed them how to steam, pinch and pleat the felt to create a cloche hat.Each hat has a very organic shape yet hugs the head with and upturned brim. 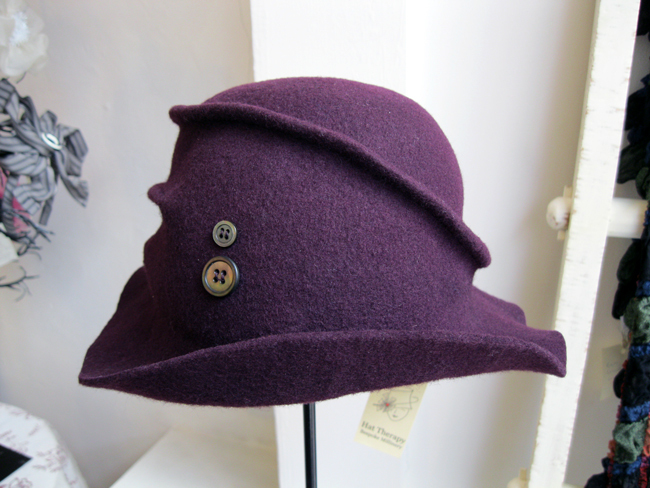 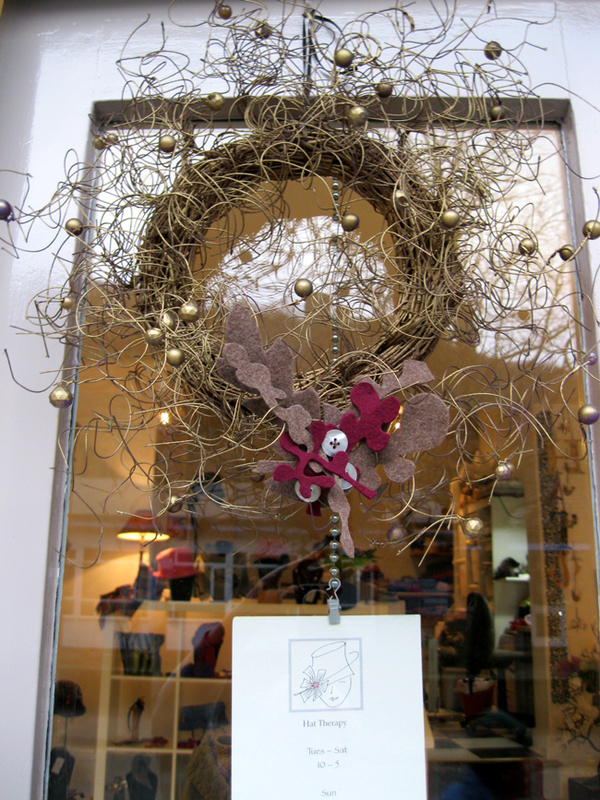 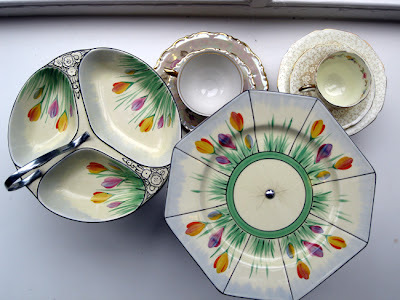 They have caused quite a stir in the shop window this weekend and are on several ladies Christmas wish list. 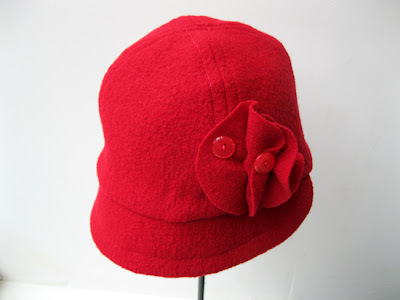 This week we shall make more in different colours. 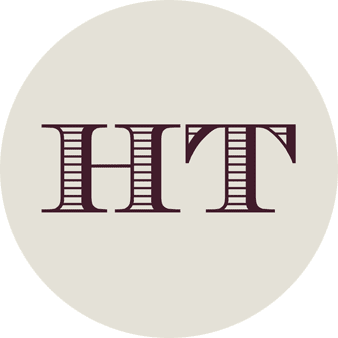 Great job ladies. 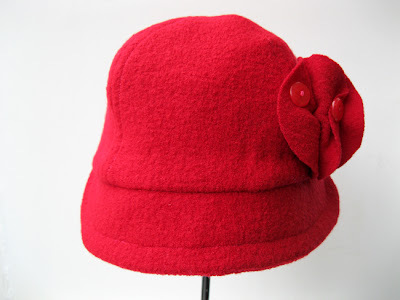 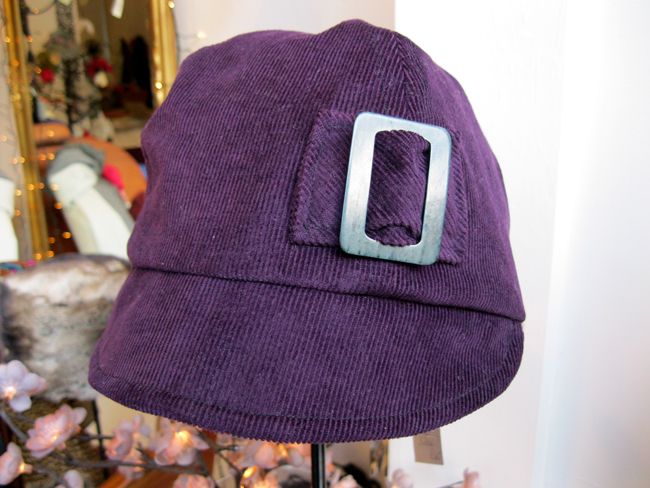 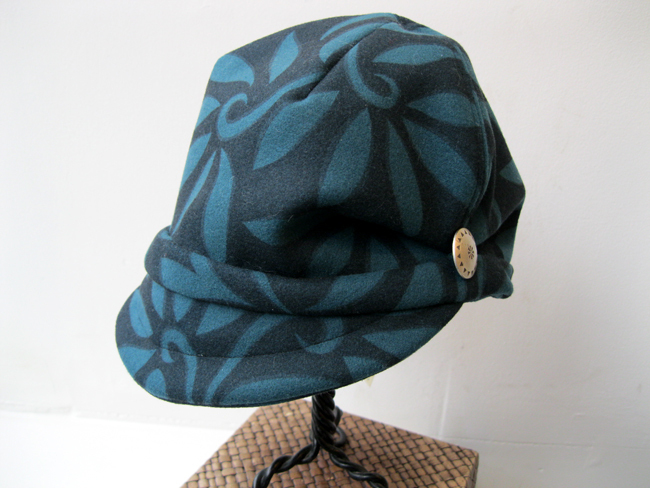 It's great to have a warm pull on hat that will slip into your bag. 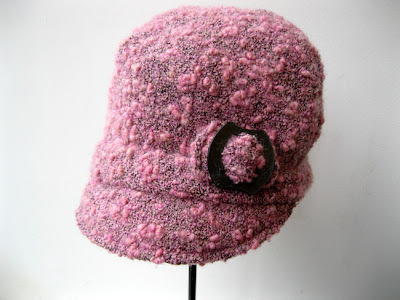 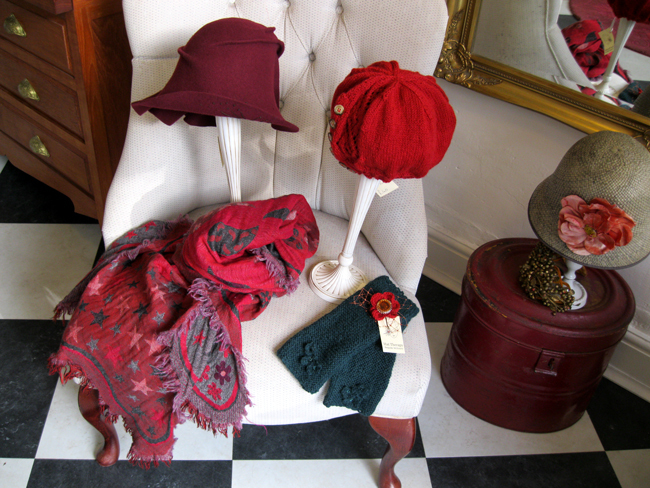 Here's a pink and black wool cap and a red boiled wool cap both look great on and suit most face shapes.On the pink there is a lovely vintage buckle and a ripple trim in red with three buttons. Both have silky linings and will not itch your head just keep you warm. 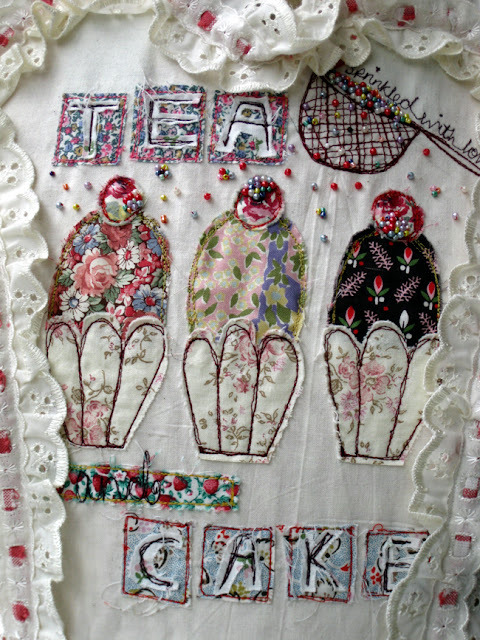 Both cost 45GBP get in touch if it's your cup of tea and I will make you one....or two.! 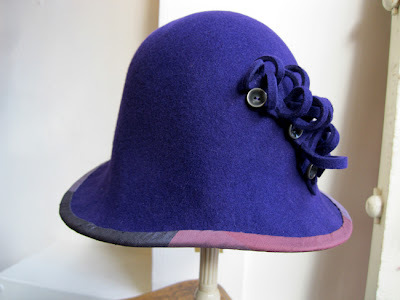 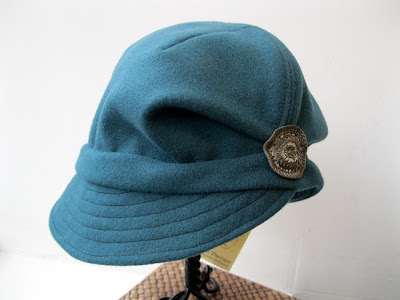 The cloche is a hat almost everyone loves although the bell cloche like my felt above does not suit you if you have a round face. 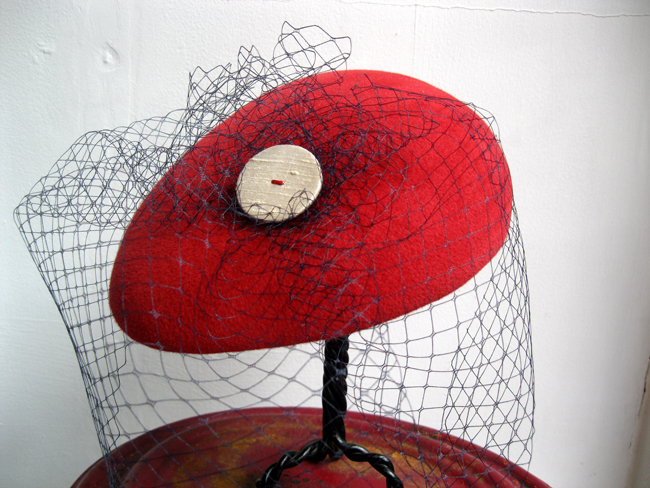 It is blocked all in one pushing the crown through a brim block in the upside down position. 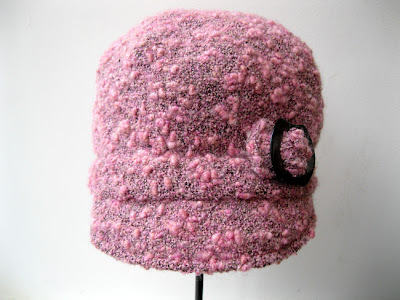 Strange I know but it eliminates the need to block the brim separately. 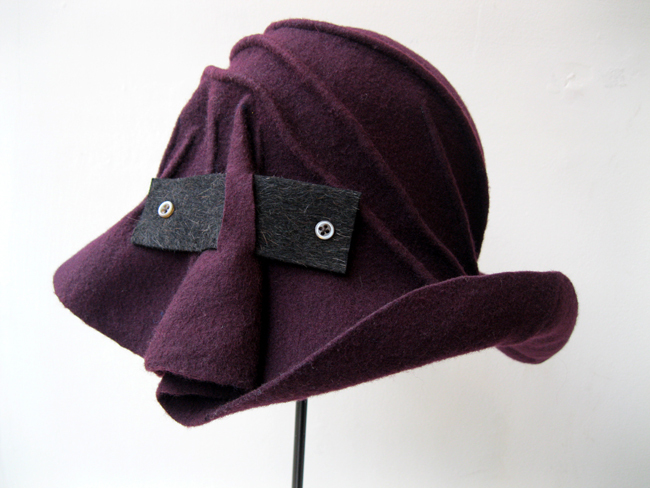 At the moment on British television we have the fabulous drama Downton Abbey which features so many wonderful hats. 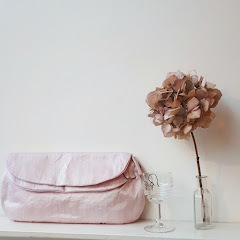 I have found a blog which features the programme. 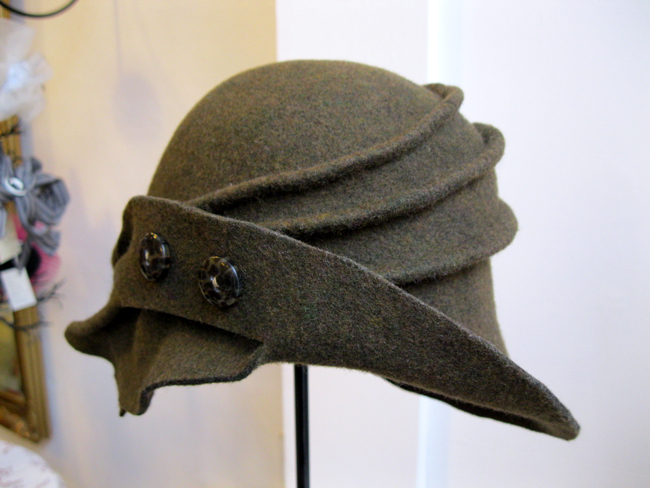 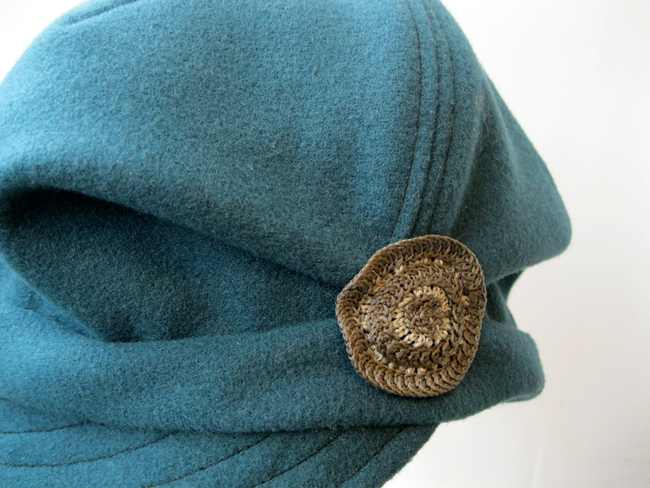 Take a look at all the period costumes, interiors and of course head wear. 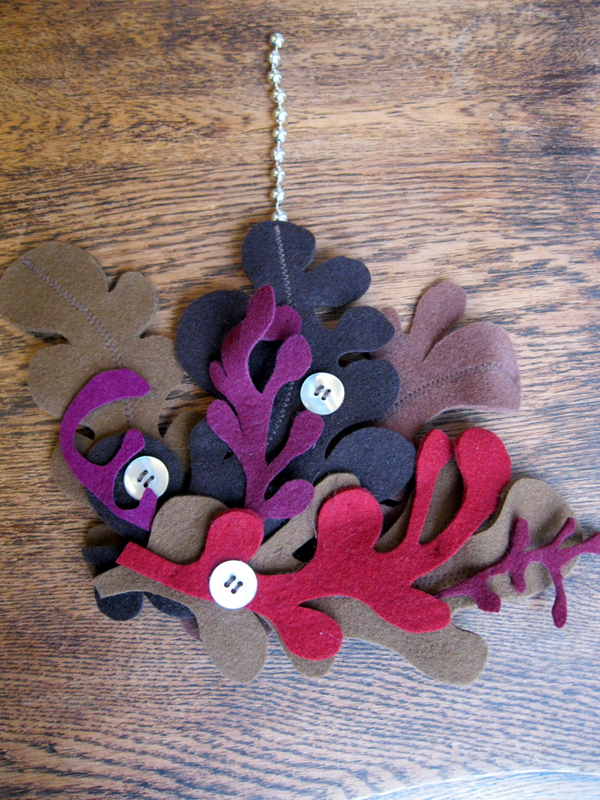 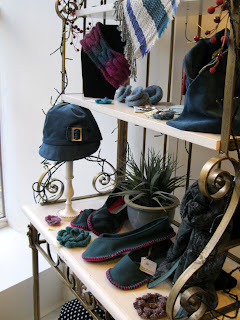 Winter is just around the corner so I am working with felt and wool fabrics at the moment. 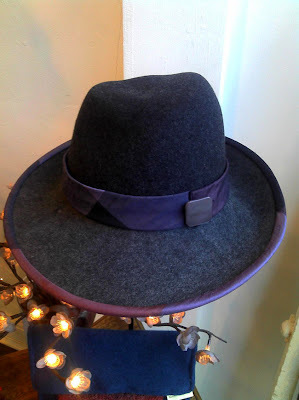 This wide brimmed hat in luxury velour felt has been trimmed with a rich fine wool tweed to contrast with the pale mushroom felt. 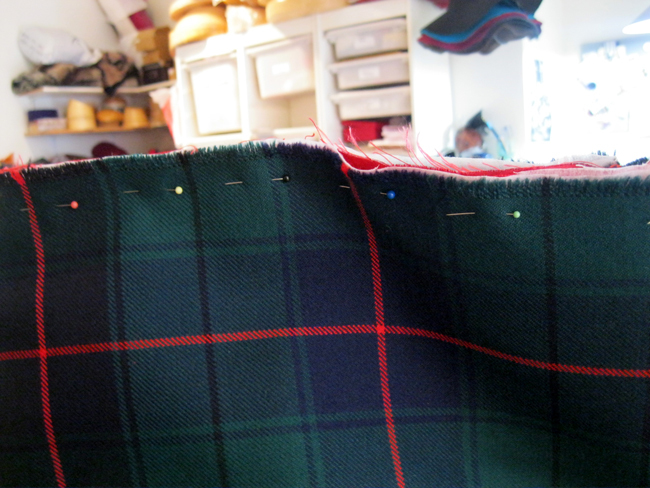 I have manipulated the brim to create a box pleat with steam while the rest has been blocked on a hat block. 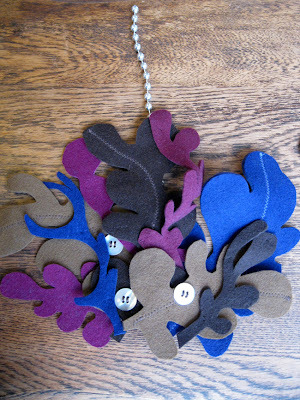 Felt blocks so well that you can create many unusual shapes even without any blocks just as long as you can secure it in place. Lots of pieces being made so will be posting some new pictures very soon. 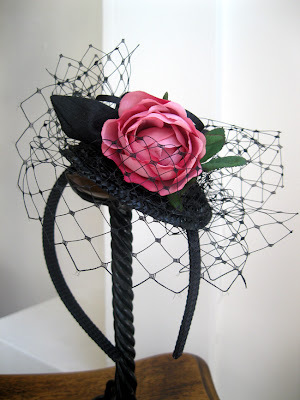 I have a lovely small top hat almost finished.! 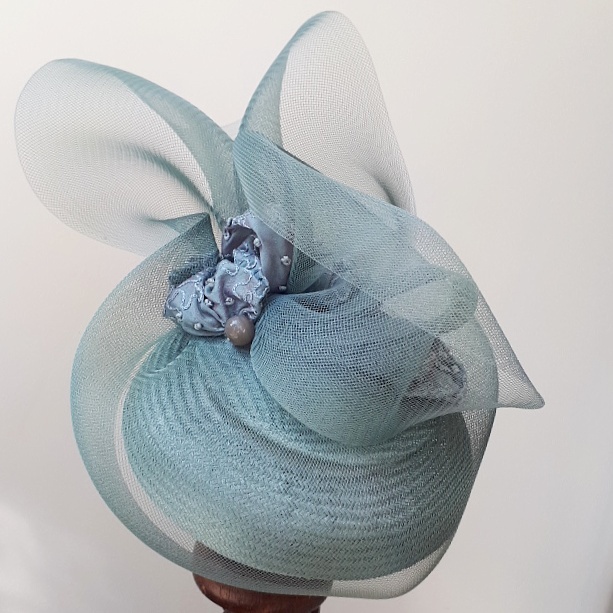 Here's two more designs ready to sell on my shop at what I always wanted online with lots of other designs in various colours. These two are both on a silk headband which is easy to wear. 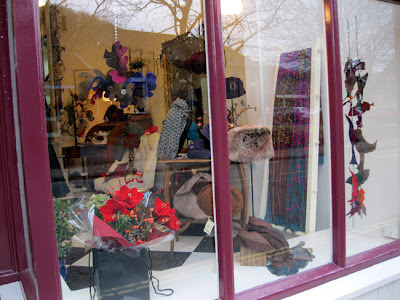 With lots of lovely hand made items to view it's well worth a visit to what I always wanted. 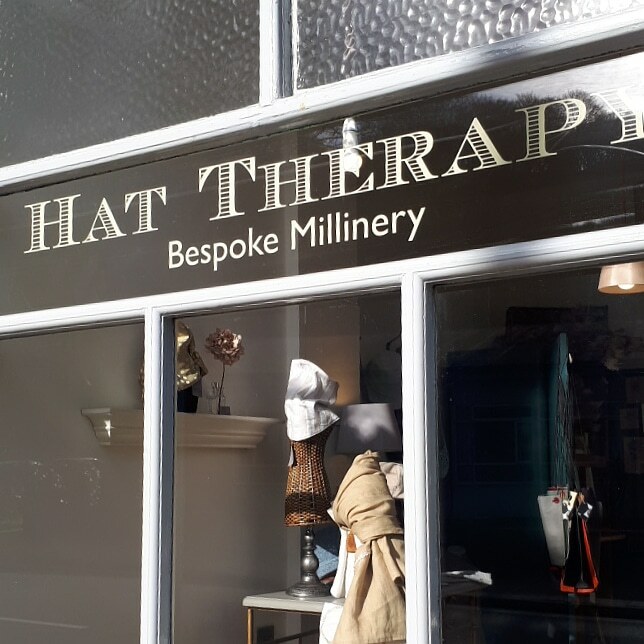 It's an incredibly busy time at the moment with the change of season to warmer hats and re stocking of other places I sell my hats. 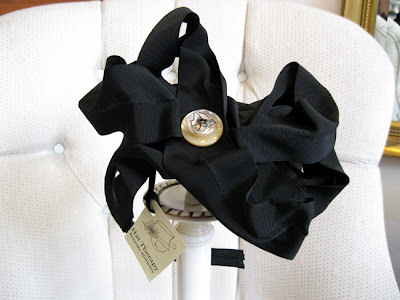 Today my intern Emily and I were sat busy making a new range of 'head candy' for the site where I sell a range of headbands but this season I am adding a small range of little cocktail caps too. 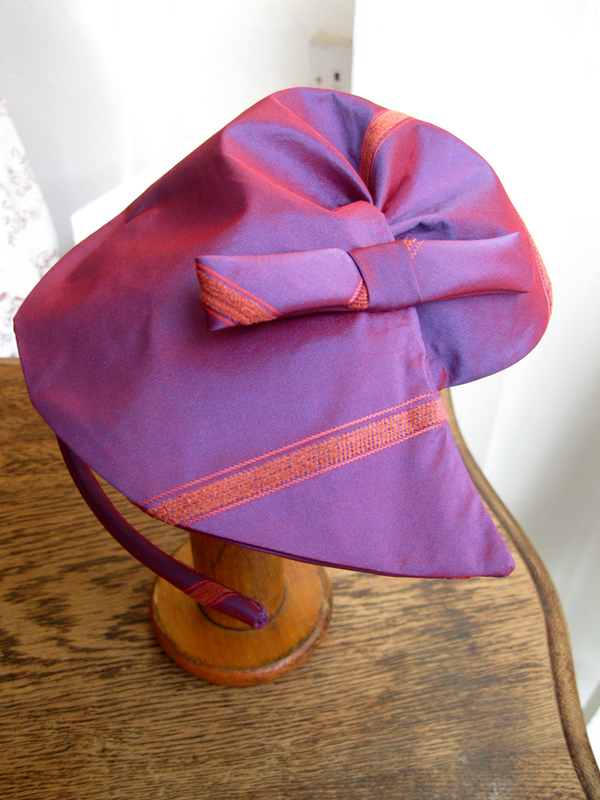 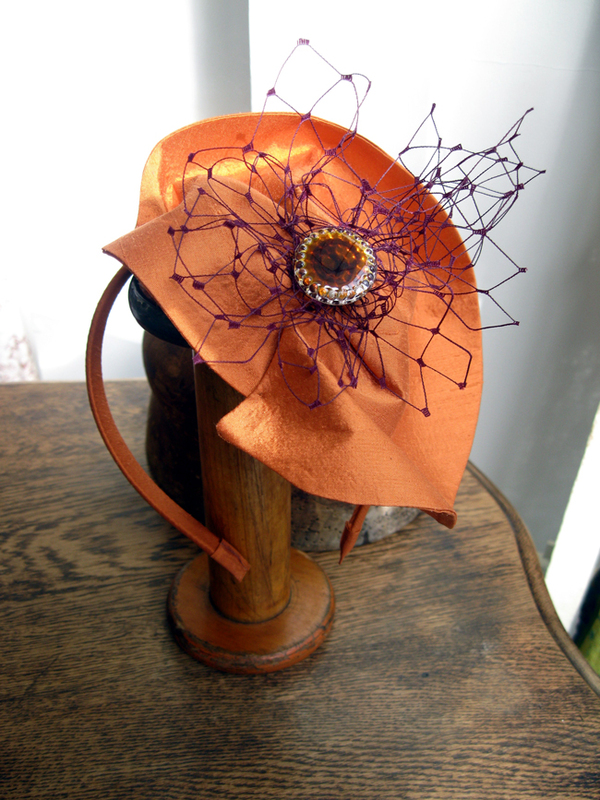 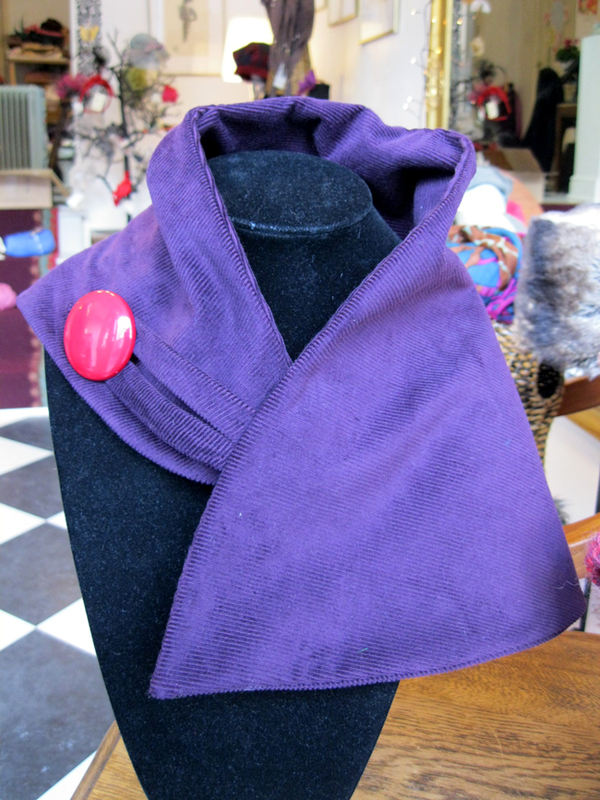 This one is a vibrant silk with veiling and vintage button. 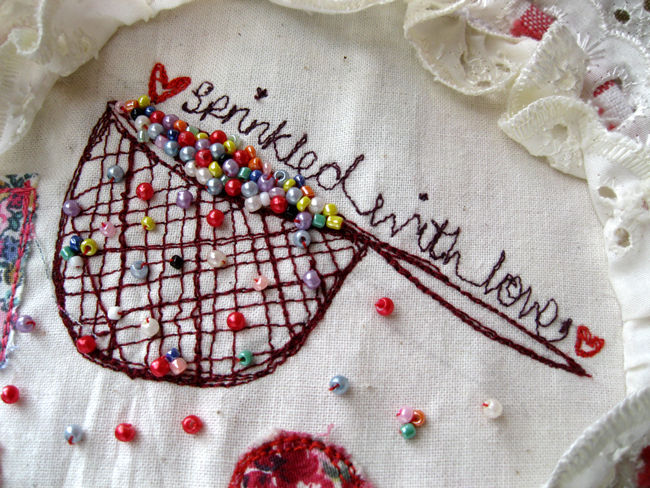 I will post a few more designs very soon. 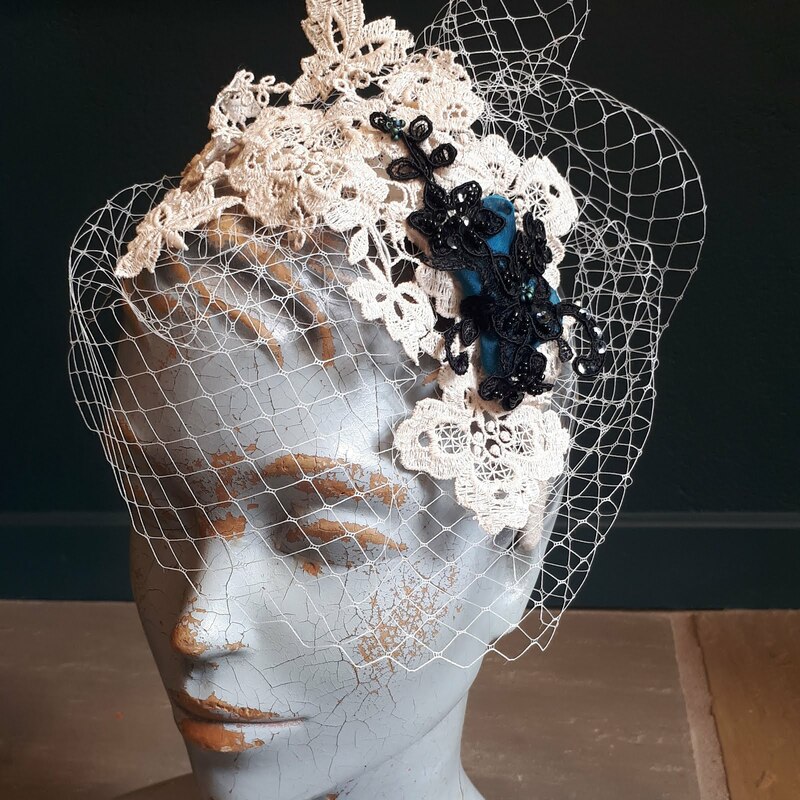 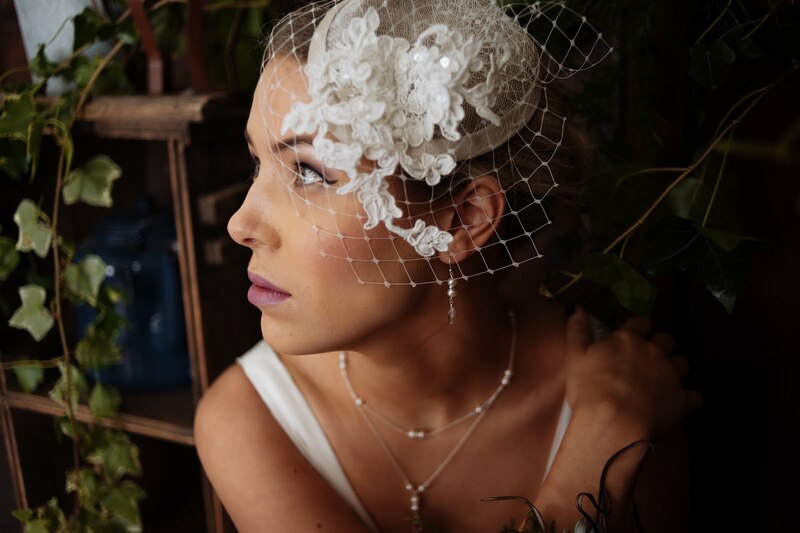 Recently I made a bridal headband, cocktail rose with veiling and a silk pill box hat for a local wedding.The reception was held at a very famous afternoon tea rooms called Betty's in Harrogate North Yorkshire where individual afternoon tea was served to all the guests. Emily my Intern has been with me for several weeks now and when she came to meet me for the first time, she brought with her an apron that she had made as her final project in college.I knew that it definitely deserved to be shown to the public and when I asked the local mother of the bride if she would let me have a few photographs of the wedding a window idea came to life. 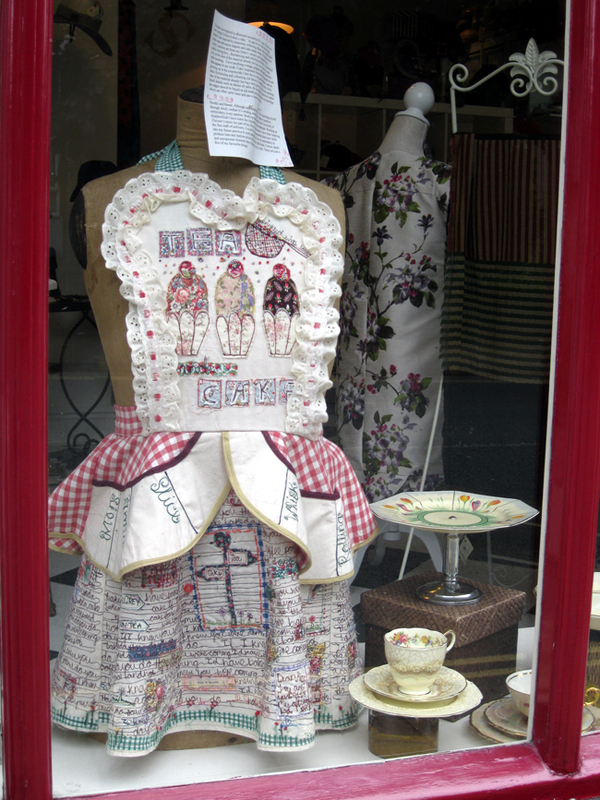 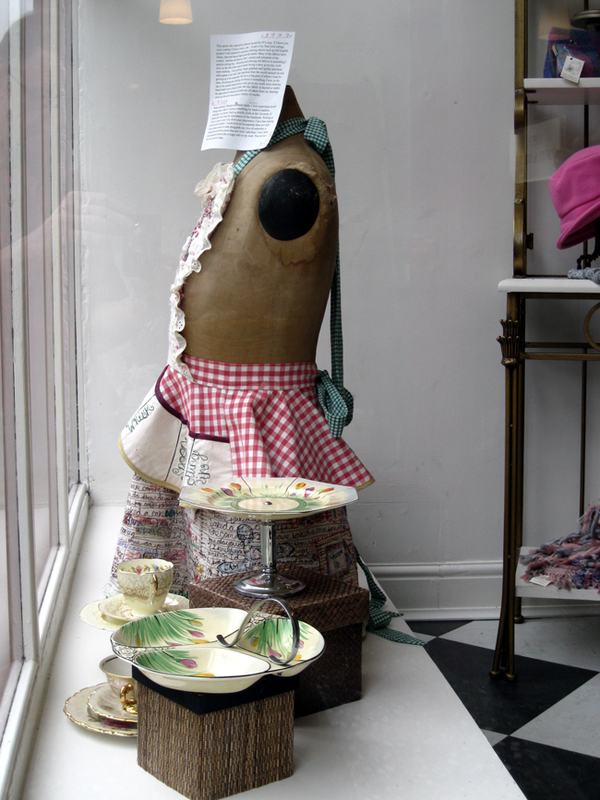 Based on the song ' If I knew you were coming I'd of baked a cake' Emily's apron with a selection of photographs and several pieces of my own tea set crockery bought at an auction a few years ago makes for a very lovely window display. 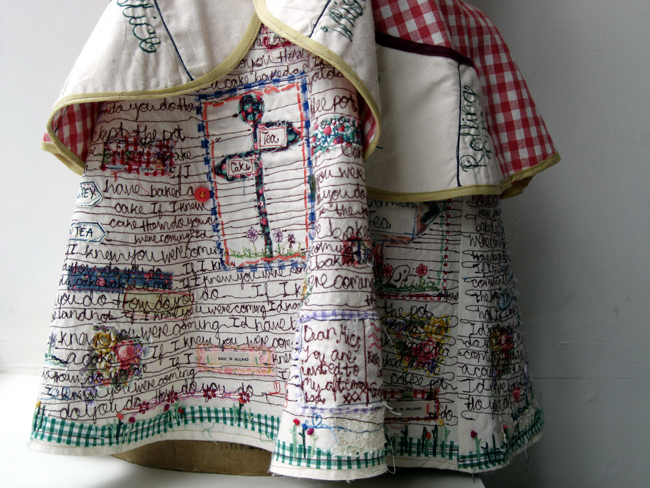 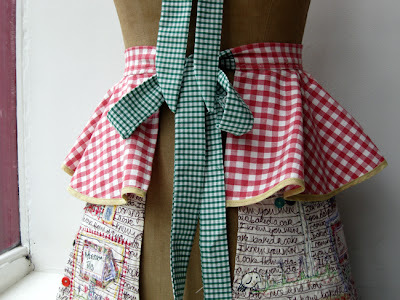 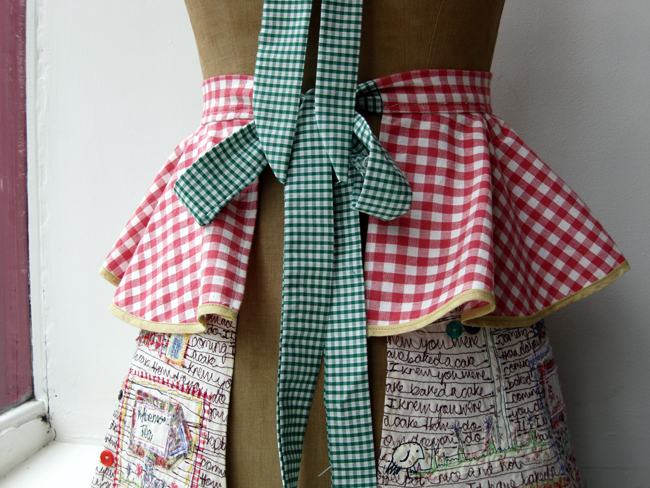 Lots of people are stopping to read the little bio Emily has written about the making of her apron and it has bought a smile to many faces.